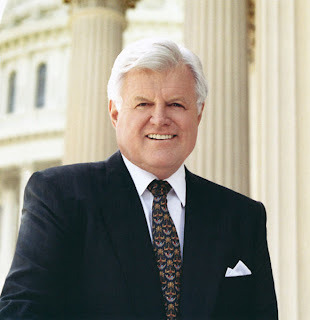 After suffering a seizure the other day, Senator Kennedy was taken to Massachusetts General Hospital where he was found to have a malignant brain tumor. The prognosis is not very good at this point. We do a lot of work with the John F. Kennedy Library Foundation and I've printed many invitations and programs for events that the Senator has been involved with. It's a sad time and my thoughts are with him and his family and everyone over at The Foundation. This is one of those times when having a stomach ache doesn't really seem so bad, ya know? I'm curious to see what people have to say about this development over the next few weeks. I know there are a lot of people that admire him and there are probably just as many people that want nothing to do with him. I hope that people can just be compassionate to the situation. I'm finding it very frustrating that I can hear the helicopters circling over Mass General as he was scheduled to be released from the hospital at 10 this morning and it's just about 5 of right now. I understand that he's a public figure, but for heaven's sake give the man some privacy.